A north London Victorian church in need of a new roof has begun replacing damaged slates with solar panels. Saint Silas Pentonville Church in Islington hit upon the idea of a solar roof after it hosted an educational project on carbon footprints. 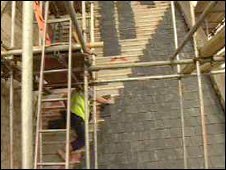 Installing the panels, which have been designed to blend in with the original slates, will cost £370,000. The church hopes to generate 47% of its energy needs with the solar tiles, saving it up to £4,000 a year in bills. The church's authorities said the 1863 building "desperately" needed a new roof because leaks were causing the church to flood several times a year following heavy downpours. It also led to high heating bills. Father Shaun Richards, who is the vicar, said: "Like all churches we have leaking roofs and there comes a point when you can't patch them up anymore. "I think one of the great things about this roof is that we wanted to be a little more innovative in the way we went about the repair." Wayne Mills, joint managing director of Nu-Lock Roofing System, which manufactured the solar tiles, said: "They are maintenance-friendly, easy to fit and can be used on new as well as old existing roofs." The church's south-facing roof made it an ideal candidate to adopt the new technology, which could cut its carbon emissions by 7,027 kg a year. The church has raised £270,000 needed for the repairs through donations and has taken a £100,000 loan from the Dioceses of London, to be repaid over five years.